Prime Reading is a benefit included with every Amazon Prime subscription that provides access to free eBooks. Unlike Kindle Unlimited and the Kindle Owner's Lending Library, Prime Reading doesn't require you to own a Kindle; anyone with a web browser can use the Amazon Cloud Reader. If you have an Amazon Prime membership, and you install the Kindle app on your phone or computer, you can use Prime Reading. How Do You Get Prime Reading? There's only one way to get Prime Reading, and it's pretty simple: sign up for Amazon Prime. Although it started as a way for Amazon customers to get free two-day shipping on their purchases, Prime has evolved into a multi-benefit subscription that includes access to movies and television shows, music, release-day delivery of new video games, and more. 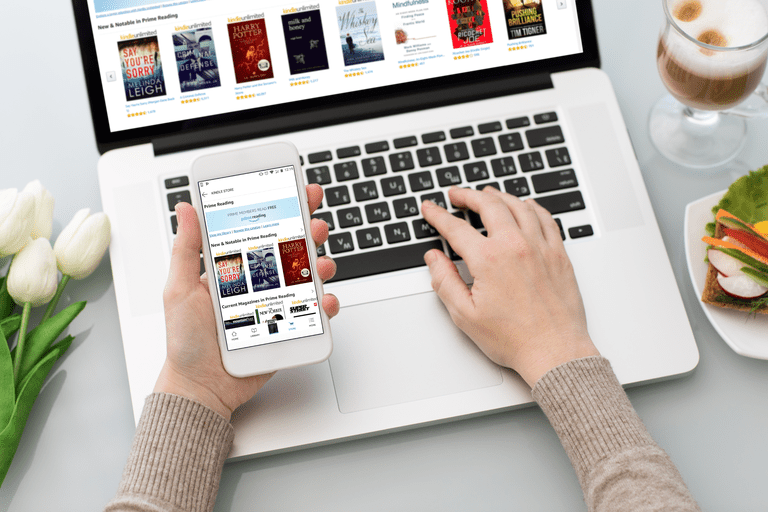 Like most other Amazon Prime benefits, Prime Reading is included with every subscription at no additional cost. What Devices Work With Prime Reading? Prime Reading works with both the Kindle and Kindle Fire, and it also works with the Kindle app. That means you can use Prime Reading with any device that has the Kindle app installed on it. This includes Windows and Apple computers, iOS devices like iPads and iPhones, Android phones and tablets, and others. The best way to see if your device will work with Prime Reading is to search its app store for the Prime Reading app. If the app is available, and you are able to install and run it on your device, then you're ready to use Prime Reading. Prime Reading works kind of like an online library. It allows you to check out a limited number of books and magazines, which you can read at your leisure. If you check out the maximum number of items, you are required to return at least one before the system will let you check out any additional titles. The easiest way to check out a book from Prime Reading is to navigate to amazon.com/primereading, where you will find all of the books and magazines that are included in the program at any given time. The same selection of Prime Reading titles is also accessible via the Kindle, Kindle Fire, and Kindle app. When you find a book that you would like to read on the Prime Reading website, or the Kindle app, you simply select the option to borrow the book for free, download it to the device of your choice, and then read it whenever you like. What Do You Get With Prime Reading? Prime Reading features a curated selection of over 1,000 books and magazines. It also features dozens of titles that include audible narration. These titles include both an eBook, which you can read on your Kindle or Kindle app, and narration similar to an audiobook. While the selection of books and magazines included with Prime Reading is limited, it isn't static. That means that the overall number of available titles doesn't change much from month to month, but new books are added on a regular basis, while others are rotated out of the lineup. Amazon has three different programs that allow you to borrow eBooks, which can get downright confusing. In addition to Amazon Prime Reading, they also have Kindle Unlimited and the Kindle Owners' Lending Library (KOLL). The biggest difference between Prime Reading and the Kindle Owners' Lending Library is that Prime Reading doesn't require a Kindle, and the thing that sets it apart from Kindle Unlimited is that it doesn't require an additional subscription. There are also differences in the number of books that are available from each service, how many books you can check out, and other factors.